Leh was once the capital of the Himalayan kingdom of Ladakh. Situated high up in the Himalayas in northern India, it lies in an ice desert region. Amidst the cold barren landscape, the town of Leh is an enchanted oasis. Watch this wonderful film from Leh and share the wisdom of this ancient land. People belonging to different religions, particularly Buddhism and Islam, have been living in harmony in Leh for centuries. They have coexisted since the 8th century and there has been no mention of any conflict between them. Leh also has people belonging to other religions such as Christianity, Hinduism, and Sikhism, who too live in harmony and form a vital part of the society. But in August 2010, a flash flood caused by heavy rain from a cloud burst created havoc in the small town of Leh. It killed over a hundred people, injured over 500 and destroyed the homes of thousands. The number of weather related incidents is on the rise across the world and the state of our environment is directly linked to the amount of peace on this planet. When people talk of environment and climate change, most of the talk is full of jargons and heavy words that are difficult to understand. Governments are busy attending conferences around the world, while people on the ground watch in confusion. While their debates and discussions continue, stories from little places like Leh will go unnoticed and voices of simple folks will go unheard. But perhaps a few people like you will share these stories with the world and together we can move towards building a greener planet and a more peaceful world. A project that will show you stories, pictures and films from some of the most fascinating places on Earth. Many, many miles away from you but perhaps not so far away in time, there exists an elite group of warriors. Their sole purpose in life is to protect the oldest treasure on this planet. They are guardians of the most fascinating places on earth and protectors of the creatures that live in those enchanted lands. The far away warriors are facing their greatest challenge ever. An enemy so powerful that all of them combined cannot defeat it. A force mightier than the mountains and stronger than the oceans . Despite their best efforts the treasure is slowly disappearing. So they have come together and formed a plan and you are reading this because you are a part of it. To be a part of our adventure please subscribe to this site. Subscribing to this site shall keep you posted on all the new stories and films that we feature regularly. We hope you will join us because the treasure is as much yours as it is ours. Chandra Taal (Moon Lake) – A magical lake deep in the Himalayas that can transport you to the moon if you look into it. There is a charming legend about the famous, beautiful lakes known as Chandratal and Surajtal in the folklore of Himachal Pradesh (a state in Northern India). The story goes that the daughter of the moon and the son of the Sun were in love. They wanted to meet, but this was very difficult as the son and moon come into the sky at different times. So, they decided to meet o­n Earth. But their parents came to know about their plan and placed a mountain between them. The two lovers tried to climb over the mountain but it kept getting higher and they could not meet. However they chose not to return and their great sorrow turned them into lakes of great purity. The Sun and the Moon felt very bad and decided to correct their mistake. That day the Sun shone very brightly, melting the snow on the mountains which filled the lakes. As their water swelled, they gave birth to two mighty rivers – the Chandra and the Bhaga, which flowed around the mountain range. When night fell, the Moon lit up the path of the two rivers and thus finally they were able to meet at a place known as Tandi. The two lovers are said to be the two lakes we know as Chandratal (Moon Lake) and Surajtal (Sun lake), o­n the two sides of the fearsome Baralacha Pass, in the district of Lahaul and Spiti, Himachal Pradesh in India. It is said that the mesmerizing, haunting beauty of the Chandratal is a result of the beauty of the daughter of the moon – who knows? The whole ambience of the lake does seem to be out of this world. The beauty and taste of crystal clear water, the crown of mountain peaks towering protectively, and yet keeping their distance, the soft, abundant grass, the serenity in the atmosphere, even the air seems to speak of magic. The Democratic Republic of Congo is the most biologically diverse country in Africa with the largest portion of the continent’s tropical forests and top of the list for Africa in virtually every group of organisms except plants (second to South Africa). Flowing through this immense forest is the second largest river system on earth, the mighty Congo. The Democratic Republic of Congo (DRC) also has striking cultural diversity with some 250-300 different languages spoken. One of the most interesting people of this country, the Mbuti Pygmies live in the forests of northeast Congo and are among the few true forest people. They are the smallest people on earth with men averaging 4’8″ and women 4′ 6″. In 1888, when he led the first expedition across the forests of the northern Congo, Henry Morton Stanley surmised that this region “held the greatest marvels of Africa”. He was right. The Congo (DRC) has a number of globally important flagship species, the best known being the bonobo or pygmy chimpanzee, the eastern lowland gorilla, the Congo peafowl, the northern white rhino, and the okapi, all of them endemic (found only in the DRC) and of great international significance. 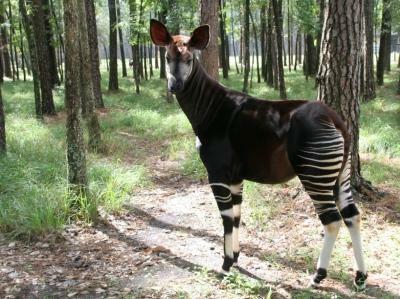 The okapi or forest giraffe is the most unique of all the flagship species and is the national symbol of protected areas of the DRC. Not known to science until 1901, when then Governor of Uganda Sir Henry Johnston came across a skin while traveling in the central Congo, the okapi was named Okapia johnstoni in his honor. The okapi’s unusual coloration helps to break up the shape of the animal in the dense rainforests where the canopy breaks up the sunlight into shifting patterns barely penetrating to the forest floor. Highlighting the biologically and culturally important okapi as a flagship, Gilman International Conservation (GIC) works to conserve the home of the okapi, the rich Ituri forest (175,000 km2) in the heart of Africa. Rallying support to protect okapi habitat, in turn, provides a secure environment for millions of rainforest species of plants and animals. To save okapi an intact forest ecosystem must be protected. By doing this, there is a chance of preserving a part of the greatest biological diversity on the African continent. Since 1987, Gilman International Conservation has partnered with the Institut Congolais pour la Conservation de la Nature (ICCN) to help insure the survival of the okapi and its home, the Ituri Forest in northeastern Congo. The Okapi Wildlife Reserve was gazetted in 1992, encompassing 13,700 square kilometers to protect a significant population of the endemic okapi. Listed as a World Heritage Site in 1996, the Reserve represents a global effort to preserve rare plant and animal life and a significant human culture. The primary objective of the Okapi Conservation Project is to develop an economic and educational base on which a functioning okapi reserve can operate. A management plan is in place to guide development and management of the Reserve. Gilman International Conservation is responsible for supporting the mandates of the management plan and is actively doing so with additional financial assistance from partners in the US, Europe and Japan. The Okapi Conservation Project is a model example of what can be achieved when local people and local government, in collaboration with a non-governmental organization, come together at every level, creating a strong, sustainable base for the future of the Okapi Wildlife Reserve, its forest, its wildlife, and its peoples. RSCF is a 501(c)(3), non-profit organization dedicated to preserving biodiversity through hands-on conservation programs rooted in sound science. RSCF utilizes the “flagship species” concept, whereby the conservation of key species leverages protection of biologically diverse ecosystems. This concept evolved from the sobering observation that historical conservation approaches often targeted only individual, high profile, and charismatic animals. Effective flagship species not only characterize diverse ecosystems, but also connect cultural, political and social value systems to nature. The human component is crucial, since collectively we must shoulder the responsibility of preserving what remains of nature. 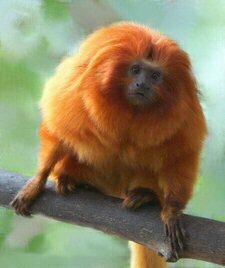 Conservation strategies for pinnacle species like Brazil’s golden-lion tamarin and the east African bongo antelope must foster broad protected-area policies and protection for whole ecosystems, thereby benefiting a myriad of plants and animals. One of the aspects that makes RSCF a very different kind of conservation organization is our “lean and mean,” hands-on approach, whereby we minimize bureaucracy and administration. RSCF’s small, focused staff conceive and execute its programs, doing everything from research in the field, to managing endangered species breeding programs, to writing scientific papers, to fundraising and all administrative functions. Many of our conservation programs are supported by contributions restricted for specific purposes, such as field research in a particular place, habitat acquisition, or endangered species husbandry. Conserving flagship species in the wild–especially where they still have a stronghold–preserves the integrity of these important ambassadors and their ecological contexts. Certainly some critical species must be maintained in captivity out of concern for their global extinction, which accounts for RSCF’s minority investment in captive breeding. However, severing the link between captive breeding and field conservation is tantamount to creating an eternal “voyage of the damned”, whereby once vital species survive only in captivity as their habitats are lost forever. Just as these species have leverage in life, their extinction has a ripple effect. When flagships disappear from the wild, their conservation power vanishes, often along with the biologically diverse ecosystems that surround them. RSCF designs sustainable recovery, reintroduction and protection programs for endangered species in the wild, and works collaboratively with governments and other conservation/research organizations to restore target species and protect critical habitats. RSCF also provides consulting and technical services to conservation teams, and forms educational, political and economic partnerships to expedite specific habitat and species conservation projects. 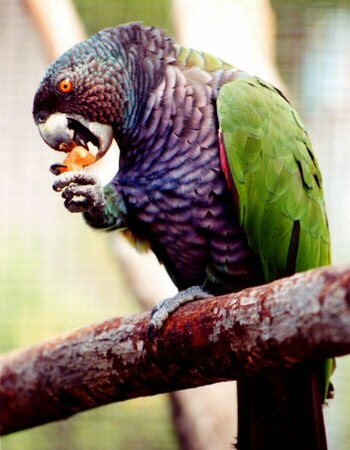 A notable example is RSCF’s partnership with the Forestry, Wildlife and Parks Division on Dominica (in its 14th year now), which has focused on parrot conservation and research. This collaboration has yielded many significant results, including declaring the world’s first new national park of the millennium, the Morne Diablotin National Park– dedicated to help protect Dominica’s national bird, the endemic Imperial Amazon Parrot (Amazona imperialis), known locally as the Sisserou. This partnership, and the conservation leverage afforded by efforts to save the Sisserou exemplify the flagship species methodology. Indeed, Dominica is the only country to have a parrot on her flag (the Sisserou, of course), which also adorns her Coat-of-Arms. Efforts on Dominica now extend to broad protected-area policies, legislation, and field conservation endeavors for a diverse array of taxa. Dr. Paul Reillo (RSCF fonder and president), discusses conservation and the role humans can play in preserving the Earth’s vanishing natural resources. 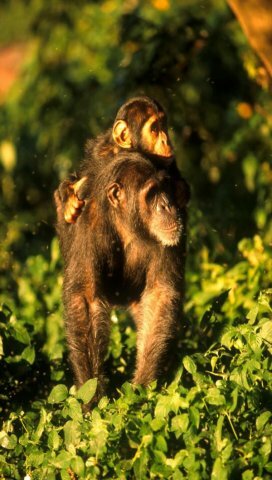 Chimpanzee Sanctuary and Wildlife Conservation Trust (CSWCT) was established as a combined national and international initiative and a globally recognized collaborative conservation effort, geared towards developing and implementing a long-term strategy for conservation of chimpanzees and their habitat, with the immediate purpose of establishing a chimpanzee sanctuary on Ngamba Island in Lake Victoria, and such other places in Uganda as the trustees may acquire.CSWCT established Ngamba Island Chimpanzee Sanctuary in 1998 for the care and welfare of entrusted animals while conserving as far as possible the ecosystem of the island. 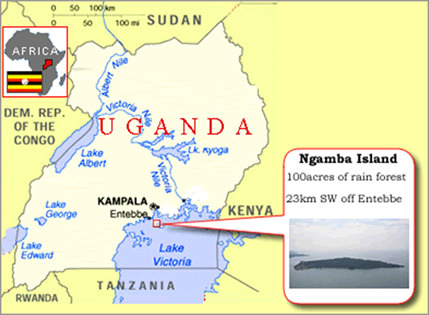 Ngamba Island is part of the Koome group of islands located in Lake Victoria (which also includes Kiimi, Nsadzi, Koome, Bulago and Damba Islands). It is approximately 23 km south-east of Entebbe. It consists of approximately 100 acres, of which 98 acres is forested and separated from the human camp by an electric fence. CSWCT’s activities include welfare of individual captive chimpanzees entrusted to its care, long-term management of a sanctuary for confiscated individuals that cannot be returned to the wild, intervention to assist individuals in the wild when deemed necessary, conservation education of the general Ugandan public with particularly emphasis on chimpanzees, ecotourism, community participation, capacity building through training, and building viable national, regional and international partnerships on chimpanzee conservation. CSWCT views the role of the chimpanzee as one of the key flagship species for conservation of wildlife in general and as an opportunity to address wider issues affecting the plight of wildlife conservation in general, both ex situ and in situ. CSWCT ensures that all its work has the support and involvement of key stakeholders including local community and, as much as possible, becomes economically self-sustaining. CSWCT has taken a three pronged approach to conservation. It is involved in education and awareness, community development, and applied research. It arranges for afforestation drives under its community development drives. It also runs Teacher training workshop where teachers are sensitized to environmental issues. The idea for PEPY, started as a cycle trip across Cambodia. Six friends rode from the Thai border to Vietnam through the red dusty back roads of Cambodia to raise funds for educational projects. The team spent five weeks visiting schools and orphanages, teaching the first PEPY environmental lessons. Since then, the PEPY team has learned to not focus trips on “giving” and “teaching” but instead on “learning” as, without learning first, we cannot expect to understand how to help to begin with. Today PEPY is supporting education for over 1,700 families in 12 villages and 6 schools in rural Siem Reap. PEPY is a social venture that combines educational development and responsible travel through both our non-profit organization, The PEPY Ride, and our tour company, PEPY Tours, which funds our programs. PEPY Tours organizes volunteer and adventure travel in Cambodia. These trips combine adventure travel with rural development education and hands-on volunteer projects. Their adventure tours in Cambodia range from environmental education bike treks to volunteer projects such as the construction of rainwater collection units at rural schools. When you travel with PEPY, you have a chance to “Go where your money goes.” PEPY Tours participants get to see some of Cambodia’s hidden rural towns and, more importantly, have the opportunity to connect with the people and programs their funding supports. PEPY, “Protect the Earth, Protect Yourself”, is a belief rooted in the environmental education lessons of the first PEPY Ride trip. If you “Protect the Earth”, in effect, you also “Protect Yourself”. Today PEPY is both an international non-governmental organization registered in the USA and Cambodia, The PEPY Ride, and an educational adventure and service-learning tour operator, PEPY Tours that helps to fund our education programs while inspiring change in the way people travel. Friends in the business world told us, “So, you expect people to sign up to pay a competitive price for their tour, AND fundraise money? Why would they do that?” and our response was “People sign up BECAUSE they are being asked to fundraise money” says Daniela Ruby Papi one of the key people behind PEPY. For travelers seeking socially and environmentally responsible adventures, PEPY Tours provides educational and volunteer opportunities that allow participants to learn from and support ongoing social development projects in Cambodia.